Melinda Hedgecorth has been living the last 14 years in one of the capital cities of flamenco dance: Sevilla, Spain. Surrounded by artists and experts, she has studied, performed and taught flamenco, gaining experience onstage with local musicians in performances at flamenco clubs such as Peña Flamenca Pies de Plomo or cultural centers such as the Centro Andaluz de Arte Contemporáneo. She has been especially influenced by studies with flamenco prodigies of our day such as Israel Galván, Mercedes Ruíz, Belén Maya, Isabel Bayón and La Moneta among many others. 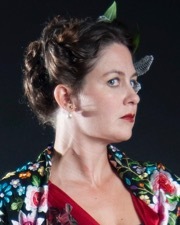 A Kansas City native, Melinda first approached flamenco at the University of Missouri, Kansas City where she graduated with a Bachelor of Fine Arts in Dance. There she had the opportunity to learn and perform with Tamara Carson. It was at this time that she began to form close working relationships with the musicians that she performs with, two of these being founding members of Flamenco Mío, Beau Bledsoe and Mark Southerland. This greatly changed how she used rhythm in her movement and her ideas of interaction and improvisation onstage. Flamenco Mío received the Lighton Foundation Grant in the summer of 2011 to travel to the south of Spain in a cultural exchange program culminating in performances in la Puebla Cazalla, Museo de Baile Flamenco Cristina Hoyos, and in Morón de la Frontera they closed the first edition of the festival: Flamenco en la Frontera. Each year she travels to give workshops, train dancers in Sevilla and perform internationally.